So what did you get your dad for Father's Day? You know it's this Sunday right??? Well, have no fear! If you're bad with dates (like me), then we've got a super simple and effective solution for you! Add some fun dad-like stickers to your awesome son/daughter and father portraits. You know, pagers, bbqs, briefcases, things that dads totally love....well at least we think...right?? You can find all these and more in our new Father's Day sticker pack for Feather, our simple image editor!!! Launch Feather now to start expressing your affection! You can find the stickers option on the bottom-right corner of the editor. If you’ve integrated Feather onto your site, let us know at api@aviary.com. Our simple image editor is free to use, and free to implement on your site. Stickers are customizable, meaning you can create your own sticker packs like this one! Check out Dogster’s custom stickers! If you’re a developer and would like to try it out, read the technical documentation or embed it on your site, visit our developers page to learn more. Did you know Americans spend approximately $68 million on Mother's day greeting cards, $2.6 billion on flowers, and another $1.53 billion on gifts??? We've taken this expense into consideration, and have created a free and fun alternative solution for you! Mother's day is right around the corner, and what better way to show your mom you care, than sending her your most prized photo covered with fresh flowers and stunning hearts! Zip up those images, compress all your love together, and email those creations asap! Launch Feather now to start expressing your affection! Add some colorful eggs, squeezable bunnies, and more to your creations! There's enough fun-filled stickers to make a grown man cry for joy! 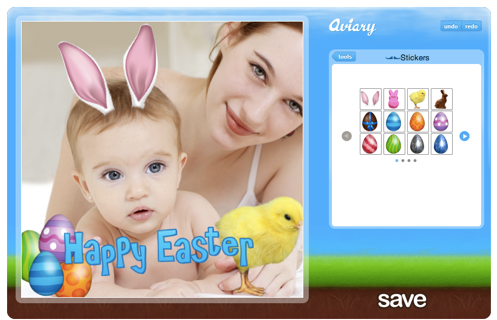 Launch our Simple Image Editor now to access our Easter themed sicker pack, and to start spreading the cheer! You'll find the stickers option on the right-hand side, along with the other tools. If that doesn't have you falling over your seat, laughing hysterically, maybe even shooting snot out of your nose and ears, we don't know what will! Alright fine, for the lack of jokes we have, we'll substitute it for an overwhelmingly exciting sticker pack to honor St. Patricks day! 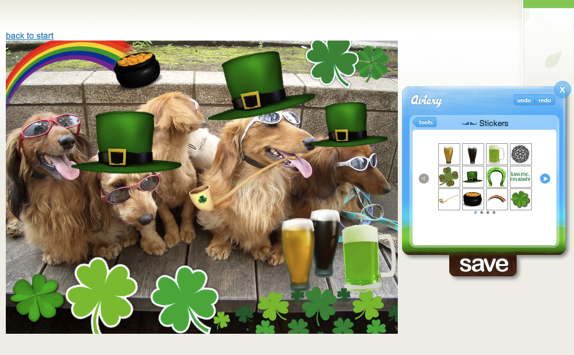 (Thursday, March 17th) Digital beers, four leaf clovers, and more have been added to Feather, our simple photo Editor. Launch our Simple Photo Editor now to start spreading the cheer. You'll find the stickers option on the right hand side, along with the other tools. Oh, and we have a question, if a man who cannot count finds a four-leaf clover, is he lucky??? Feather, our simple photo editor, for you lovebirds to get extra lovey-dovey! 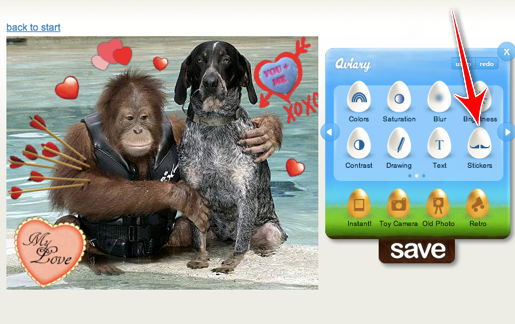 Launch our Simple Photo Editor to start spreading the love. You'll find the stickers option on the right hand side, along with the other tools.